Despite my resistance to the idea of taking a stress test, I finally acquiesced and went through it this week. 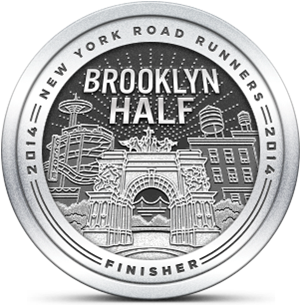 My experience at the end of the Brooklyn Half provided the impetus to do it. Actually, it was strong encouragement from my wife, the Runsketeers and my friend KWL that made me go through with it. 1. Arrive at doctor's office at your scheduled time. 2. Wait an hour to be called in. 3. Wait for the doctor in the exam room. You can pass the time by reading your chart on the computer display (at least that's what I did). 4. Have a conversation with the doctor about how you ended up in the medical tent after running a half marathon. Hint: his response will always be, "I want you to run a stress test today." 7. Have an heart ECHO sonogram. 8. Go to stress test lab and wait. 9. Get your first injection of thallium, a radioactive isotope that's used as a trace agent during the imaging process. Very reassuring. 10. Go into the imaging room and get scanned for 12 minutes. 11. Go into another sonogram lab and have carotid arteries checked. 12. 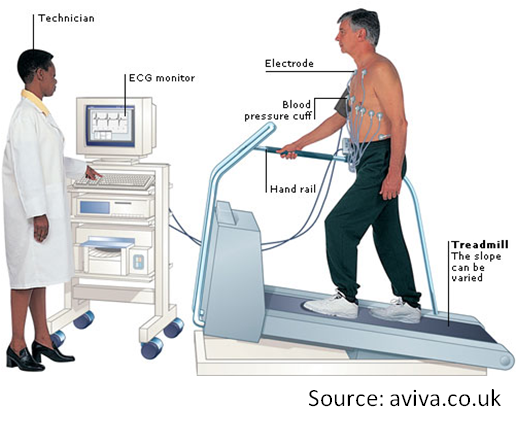 Go into the room with the medical treadmill, where the technician attaches electrodes all over your body attached to a belt unit that you wear during the process. 13. Start at walking pace, with the goal of getting heart rate over 140. She ended up putting the incline to 16% and the speed to over 5 MPH to get me there. 14. Get your second injection of thallium and wait. 15. Get your second imaging to compare to the first after exercise. 16. Go home six hours after you arrive. The good news is that you do get feedback throughout the process. My doctor said my EKG and ECHO were fine, the sonogram tech said the same about the carotid check and the treadmill technician said I didn't have a single missed beat during my session. I needed my doctor to review the imaging results. If there were concerns, I would have got a call yesterday. All of that, and no issues. So why am I running so slow? My doctor's office should now deliver my clearance form so I can use my company's fitness center. I can then do workouts in the morning when I get into the office. Without that, my options are either to go back to 4 AM runs, or work out when I get home from work. I worked from home today and got in a few miles before I started what turned out to be a busy day. It's the weekend now, and I hope to give those Cascadia's their first experience on the trails either tomorrow or Sunday. I'm glad everything was ok! But, yes, that question still remains.. now what is your next step? How did you run today? I still need to get my blood results back. That may tell me something. Today's run was good. I went out with only an intention of covering my distance and I ended up pacing 30 sec / mile better than my last few week's average. Now that I know I can push without worrying about an underlying issue I'll add some speed play into my next run. Thanks Bill. It's really really un-fun. I left out all the waiting periods between steps. But it's good to know that things are okay. Yes, it's probably aging but I don't want to concede to that yet! I'm still waiting for the blood test results before I can truly say no news. Imagine Dragons are now playing in my head. I'd rather listen to Radioactive then be radioactive.